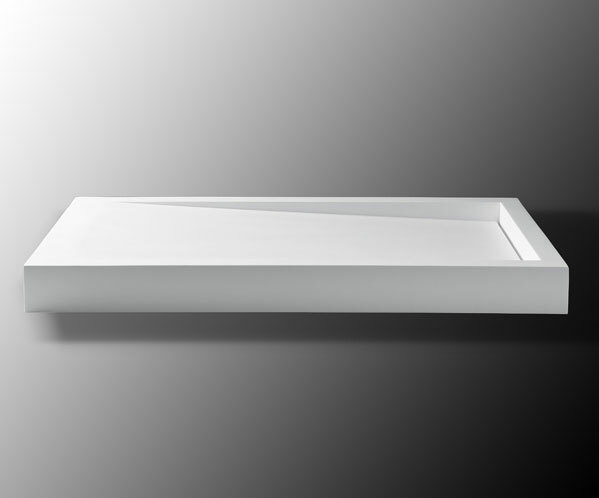 Boutique Baths are made from Cian® Solid Surfacing, a renewable decorative solid surface material manufactured from an advanced blend of acrylic modified polyester resin and mineral fillers, primarily Aluminium Hydroxide (ATH). Cian® Solid Surfacing is made to stringent industry standards. Its proprietary formulation gives it superior thermal shock resistance and an exceptional smooth, solid finish. It is a colour throughout material providing all the incredible benefits of solid surfacing. Cian® Solid Surfacing’s superior process technology ensures an air/void free material guaranteeing the product a solid homogenous, 100% non-porous surface. All products are renewable and repairable due to the impermeable surface. Minor scratches and scuffs can be easily removed. The non-porous surface guarantees superior stain resistance as well as microbial resistance. Through the use of solid surface materials, state of the art tooling and pattern making capabilities as well as attention to detail, our process yields the most unique freestanding bath products available on the market today. Our designs are constantly updated creating a range of baths which is innovative and cutting-edge. Boutique Baths also has a flat sheet and fabrication capability and we can therefore produce baths shown in our facet range. Customers have the choice of silk matte or gloss finishes, depending on their requirements. Boutique baths have a unique integrated waste overflow systems built into the walls of the baths. Boutique baths offer easy installation and all products are supplied complete with waste connector kits, bath waste and trap. A fully comprehensive instruction sheet is supplied to assist with installation. Support and service on the ground is quick and efficient due to a small team of highly dedicated and experienced individuals. All products carry a 25 year warranty.